Our cellar doors are open to visitors who want to learn about the secrets of traditional winemaking in Rioja Alavesa. We have a welcoming dining room where you can taste our wines accompanied by tapas. If you would like to visit us, you can make arrangements through the contact form on this website or by calling the number listed above. Tours are offered in Spanish and Basque. Winery tour: €10/person Two wines are poured. Tasting without tour: €10/person Three wines and a tapa. 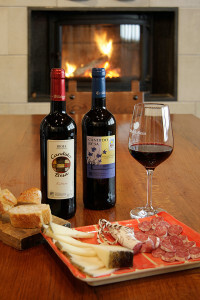 Snack plus wines: €15/person (winery tour not included). — The winery has a dining room.